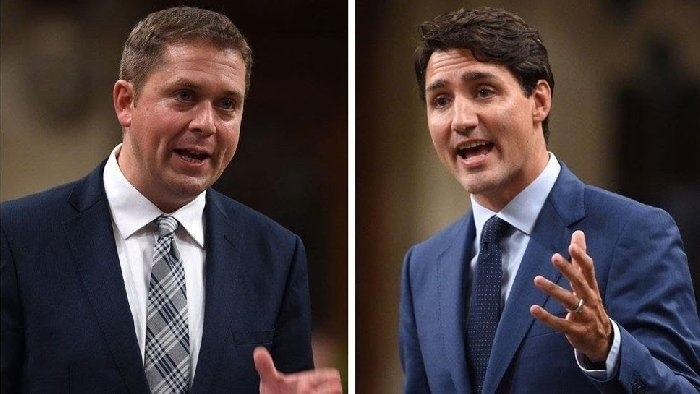 Conservative Party Leader Andrew Scheer on Sunday dared Prime Minister Justin Trudeau to sue him for defamation for statements he made about Trudeau’s involvement in the SNC-Lavalin scandal, after receiving a letter from the prime minister’s lawyer that threatened legal action. Scheer released a letter from Trudeau’s lawyer, Julian Porter, saying the opposition leader had issued a press release that went “beyond the pale of fair debate and is libellous” by claiming Trudeau interfered in the SNC criminal prosecution. Porter said his letter, dated March 31, should be “treated as notice” of possible action under the Libel and Slander act of Ontario. Scheer said he would welcome a battle in court after having Liberal-dominated parliamentary committees shut down hearings into the affair. The Globe and Mail reported on Feb. 7 that Trudeau’s office put pressure on Jody Wilson-Raybould when she was attorney-general to help SNC-Lavalin Group, which had tried unsuccessfully to win a deferred prosecution agreement with federal prosecutors over corruption charges. Trudeau initially called the story “false,” though he later acknowledged there had been ongoing conversations between himself, his officials and the then-attorney general. At a committee hearing, Ms. Wilson-Raybould testified that she received several phone calls from senior staffers of the Prime Minister’s Office, including former principle secretary Gerald Butts, as well as Clerk of the Privy Council Michael Wernick, urging her to revisit her decision not to intervene in the prosecutors’ decision. The ensuing controversy led to the resignations of Wilson-Raybould, Treasury Board president Jane Philpott and Gerald Butts, as well as the earlier than planned retirement of Wernick.